Add 1/2 cup soda to a saucepan. Sprinkle gelatin over and let sit for two minutes. Add to low heat, and stir until dissolved. Add remaining soda and vodka. 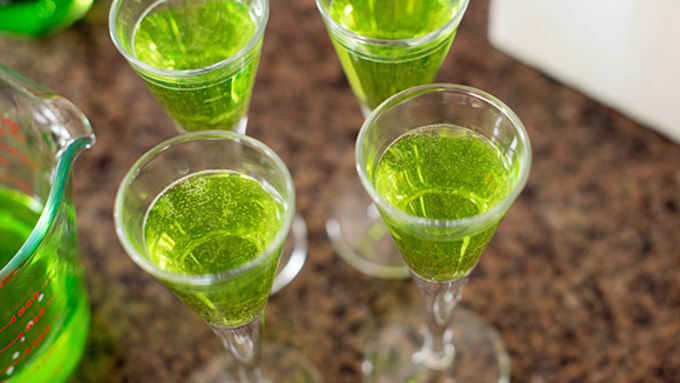 Pour into a measuring cup and into shot glasses. Let firm up in the fridge for 2 hours. Add coconut milk to a small saucepan and sprinkle gelatin over top, let sit for 2 minutes. Heat over low and add sugar. Stir until completely dissolved. Add vodka. Pour until a measuring cup and and gently pour over green layer. Chill until completely firm, about 4 hours or overnight. 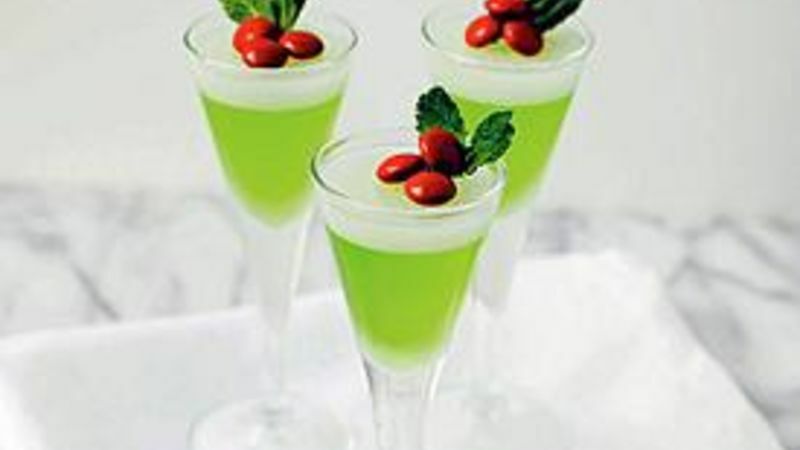 Garnish with mint leaves and red chocolate candies. Want to make your holiday party even more festive? 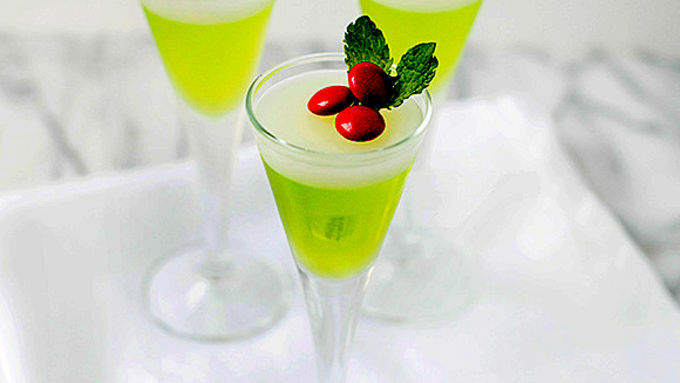 Add Mistletoe Jelly Shots to your menu. Gorgeous green and white layers with a sprig of holly are so pretty, but also taste great. They scream holiday party. 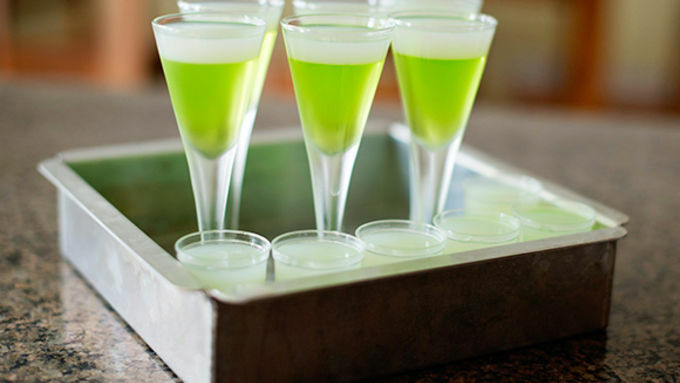 Jelly shots are not at all difficult to make, but they do require some planning. To make the pretty layers, the green needs to be fully set. So please be patient, otherwise the white will leak. While it will still taste great, it will look more tie-dye than striped. The hardest part of making jelly shots can be finding the perfect container for them. The best place to start is a party supply store. I took a walk around and found so many options, I could make jelly shots for just about every occasion. Think outside the box a little and you will be able to make them in just about any shape and size. Need a to-go version? I found these great plastic shot glasses at my local party supply store. These will be most popular at your party. Have a happy holiday!